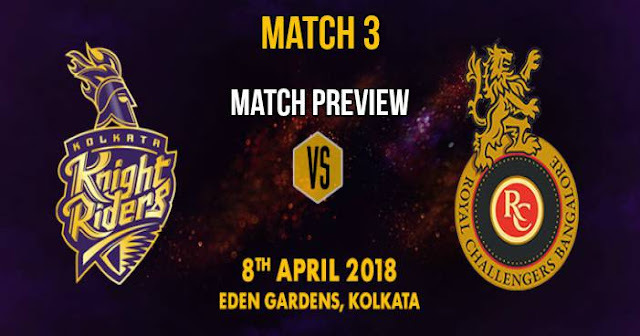 The third match of the 11th season of Indian Premier League (IPL 2018) will be played between two times champions Kolkata Knight Riders (KKR) and Royal Challengers Bangalore (RCB) at Eden Gardens Stadium, Kolkata on Sunday 8 April 2018. As far as the weather is concerned temperature will be hovering around 30ºC and it will be humid. There is some rain on Saturday but there are no rains forecasted on Sunday. Eden Gardens pitch is expected to be on the bouncier side and provide help to the pacer. Chasing is the preferred norm in night games in Kolkata with dew likely to be a factor. Since 2013, KKR has lost only a game against Mumbai Indians in IPL 2017 at the Eden Gardens while chasing. So most probably team winning toss will likely to bowl first. The major change in the Kolkata Knight Riders is the absence of their most successful captain Gautam Gambhir; who was bought by the Delhi Daredevils in the IPL 2018 Auction. Gautam Gambhir led KKR to win the two IPL title in 2012 and 2014. KKR CEO Venky Mysore recently confirmed the Australian batsman availability in the tournament. Chris Lynn is expected to open along with Robin Uthappa. Subham Gill the opener in the Indian team which won Under-19 World Cup may get the third spot. Dinesh Karthik, Nitish Rana and Ishank Jaggi fit well in the middle order. It will be followed by all-rounder Andre Russell and Sunil Narine. It will be followed by two spinners Kuldeep Yadav and Piyush Chawla along with pacer Vinay Kumar and Mitchell Johnson. As usual Royal Challengers Bangalore looks strong on paper yet hasn’t won a single IPL title in a decade. With the likes of Virat Kohli, AB de Villiers, Brendon McCullum and Quinton de Kock, batting heavy Royal Challengers Bangalore will play under the captaincy of Virat Kohli. Brendon McCullum and Parthiv Patel are likely to open for RCB. The middle order comprises the core of RCB batting Virat Kohli and AB de Villiers along with Manan Vohra and Sarfaraz Khan. One of the Colin de Grandhomme and Corey Anderson can play as all rounder. Bowling unit may Umesh Yadav, Yuzvendra Chahal, Chris Woakes and Washington Sundar. Kolkata Knight Riders and Royal Challengers Bangalore have met 20 times in Indian Premier League (IPL) and KKR had won 11 of them while RCB won the remaining 9 matches. KKR has been dominant in the last two seasons by winning three games of the four. Of the eight matches played between RCB and KKR at Eden Gardens, KKR lead by 5-3; RCB had won 3 matches against KKR by batting second. When these two teams met at the Eden Gardens last season, KKR bundled out RCB for 49 in 9.4 overs – the lowest team total in the history of IPL. Playing XI for KKR: Chirs Kynn, Robin Uthappa, Dinesh Karthik (c & wk), Nitish Rana, Andre Russell, Rinku Singh, Sunil Narine, Kuldeep Yadav, Piyush Chawala, Mitchell Johnson, Vinay Kumar. Playing XI for RCB: Brendon McCullum, Quinton de Kock, Virat Kohli, AB de Villiers, Mandeep Singh, Sarafraz Khan, Kulwant Khejroliya, Washington Sunar, Yuzvendra Chahal, Chirs Woakes, Umesh Yadav.